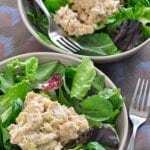 Salmon Salad Mix | JPMA, Inc.
Add relish, yogurt, mayonnaise and lemon juice. Chill before serving. Serve on a bed of salad greens or use as a sandwich filling. Small bones are soft after canning. They can be mashed and eaten for more calcium.